Slice each chicken breast in half and pound with a mallet to about 1/4-in. even thickness. Season with salt and pepper if desired, and place in a medium bowl. Add 1 Tbsp. of Balsamic Vinegar, turning chicken until evenly coated. Cover and marinate in refrigerator for 1 hour. Remove chicken from refrigerator. Lightly dredge in flour, shaking off the excess. Heat oil in a large skillet over medium heat, brown chicken for 2 to 3 minutes on each side, or until cooked through. Remove from skillet and keep warm. In the same skillet over medium heat, stir in wine and remaining 2 Tbsp. of Balsamic Vinegar, and cook for 1 to 2 minutes. Stir in pasta sauce and cook for 5 to 7 minutes, or until heated through, stirring occasionally. Stir in olives and spoon sauce over warm chicken breasts. 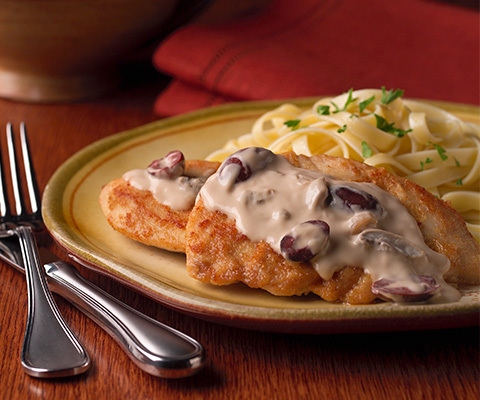 If desired, substitute Classico® Mushroom Alfredo Pasta Sauce with Classico® Four Cheese Alfredo Pasta Sauce. We couldn't stop eating it. Quick and good.